“Every house has a history to tell, including 94 Main Street, one of the grandest of the historic homes on-island. Known affectionately as one of the Two Greeks, this stately house was constructed in the Greek Revival style and completed in 1847. The building of the house must have been an optimistic sign to islanders at a time when the whaling economy was suffering and the Great Fire had just destroyed a large portion of the town. The house was the last true mansion constructed by a prosperous whale-oil merchant. 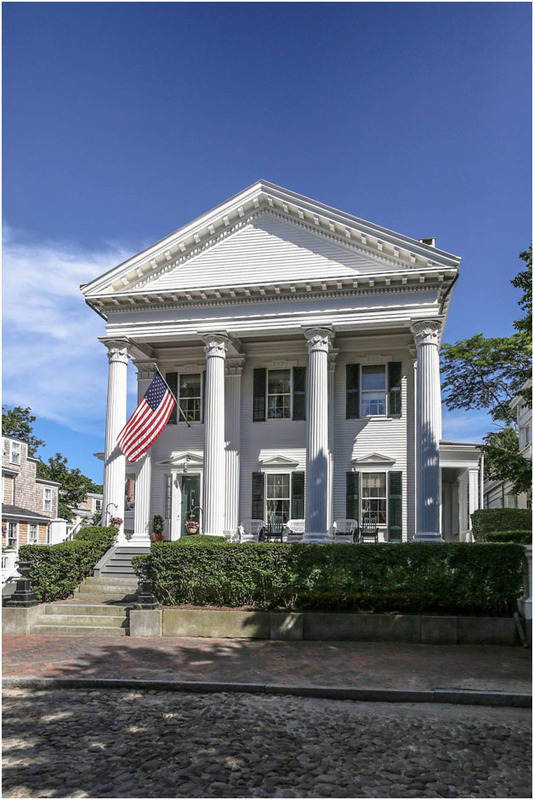 William Hadwen had built the other Greek house next door for himself and his wife, Eunice Starbuck, a year earlier, and appears to have refined the design to include domed spaces and more elaborate detailing. Local lore has it that the house was a gift for Mrs. Hadwen’s niece, Mary Swain, and George Washington Wright, a Boston merchant who had married Mary in May of 1844 at the Unitarian Church. Hadwen retained ownership, but the house became known as the Wright Mansion, and it was soon filled with children, including Eunice, born in 1847; George W. Jr., born in 1848; and William, born in 1849. The Wrights’ tenure at the house was short-lived. Perhaps the rapid decline of Nantucket’s economy or the California gold rush lured George Wright to San Francisco in 1849. He would become one of the leaders of the California territory, and when it became a state in 1850, he was among its first representatives in Congress. Family members Eliza and Nathaniel Barney took up residence in 94 Main in the late 1850s and stayed on there into the 1860s. Barney was Hadwen’s business partner and Eliza Barney and Eunice Hadwen were sisters. Coincidentally, the two sisters lived across Main Street from their three brothers, Joseph, William, and Matthew Starbuck, who occupied the Three Bricks. 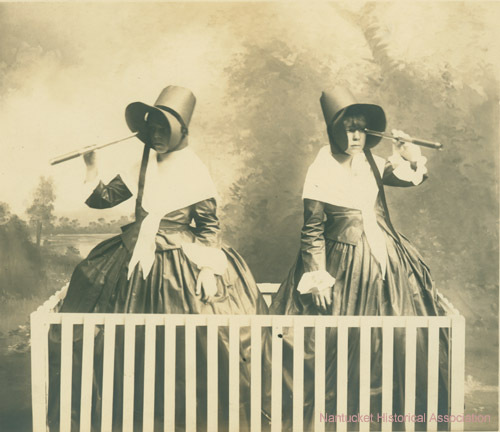 The Barneys were outspoken advocates for the leading issues of the day, which included the abolition of slavery, woman suffrage, and the temperance movement. They are probably best known, however, as the keepers of early family records. Their work still serves as the major source for genealogical research on-island. It was not until William Hadwen’s death in 1861 that the house came into legal possession of the Wright branch of the family, but Hadwen included a stipulation in his will that Nathaniel and Eliza could remain there for as long as they chose. Nathaniel died in 1869, and in the early 1870s Eunice would build her own architecturally imposing Main Street house—the large blue Victorian at 73 Main. The Wright Mansion remained in the family until 1882 when it was sold to Isabella M. Coffin, wife of Allen Coffin, an avid newspaperman who later earned a law degree from Columbia and returned to the island to practice. Coffin was also a prolific author and genealogist who published an extensive history of the Coffin family in 1881. Coffin was long associated with the Prohibition Party, serving as its chairman and running as the party’s candidate for governor of Massachusetts in 1896. Locally he served four terms on the Board of Selectmen. In 1907 Coffin sold the house, to Eben Moore Flagg, a dentist and world traveler who served as honorary consul of Paraguay. Dr. Flagg was no stranger to Nantucket; his father was the well-known American artist George W. Flagg, who summered here, and his uncle, William Flagg, developed ‘Sconset’s north bluff and constructed the first cottage near the lighthouse, called Flaggship. Eben set up his “modern” dental practice at 94 Main and resided there with his English-born wife, Henrietta, and daughter Louise. Curiously, his advertisements for his practice in the Inquirer and Mirror in the early years of the twentieth century note his former residence as 61 Fifth Avenue, New York, and his fluency in German, Portuguese, French, and Spanish. Henrietta held the house until her death in the 1920s, leaving it to three women she had befriended, including Anna Ward, formerly of the Ships Inn Grill Room, who served tea, lunch, and dinner in the “Old Wright Mansion” for a few years in the 1920s. The house was in poor repair, however, and debt forced a mortgagee sale. In 1927, the property was sold to banker Leopold Chambliss and his wife, Anna Yerkes Chambliss, of New Jersey. Anna retained the house after the Chamblisses divorced in the 1950s, and in 1962 it was sold by her children to John A. and Katherine (Tatina) Sherman Lodge of Brookline. Like several preceding owners, John Lodge was an attorney who worked in Washington, D.C., and Boston, and Tatina was a well-educated woman who grew up in Venezuela as the daughter of a geologist and crude-oil explorer. During the fifty-two-year Lodge ownership, their stewardship of the property and a love for the island’s history was evident. Due to this a NPT Preservation Award was created in their honor. To learn more about the John A. and Katherine S. Stewardship Award and the NPT Preservation Awards click here. Today the house awaits a new owner, but the rich history and the Lodge legacy will live on. The house is protected by a preservation easement (click here to learn about the NPT’s preservation easements) that Tatina Lodge placed on the house in 2009 to ensure that not only its exterior, but its significant interior features will be preserved for future generations. Sadly, Katherine S. Lodge passed away earlier this year. A longtime friend Mark Hubbard gave his remarks during the 2014 Preservation Award Ceremony. Learn more about the true preservationist at heart click here. 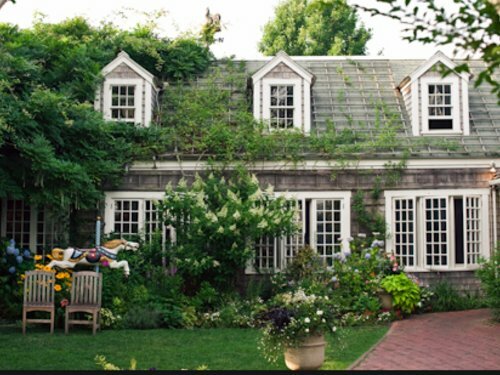 “Did you know that the roof platforms on a historic Nantucket house, referred to as “widow’s walks “on the mainland are called “roof walks” on island? They were used not only for observation, but to provide easily access to the roof and chimneys in the event of fire. Roofwalks were constructed during the whaling heydays, but by the late 19th century most were in poor condition and often removed. A 1937 survey showed that only about 10% of the roof walks remained. Today roofwalks can be restored if photographic documentation indicates they once existed on your house. 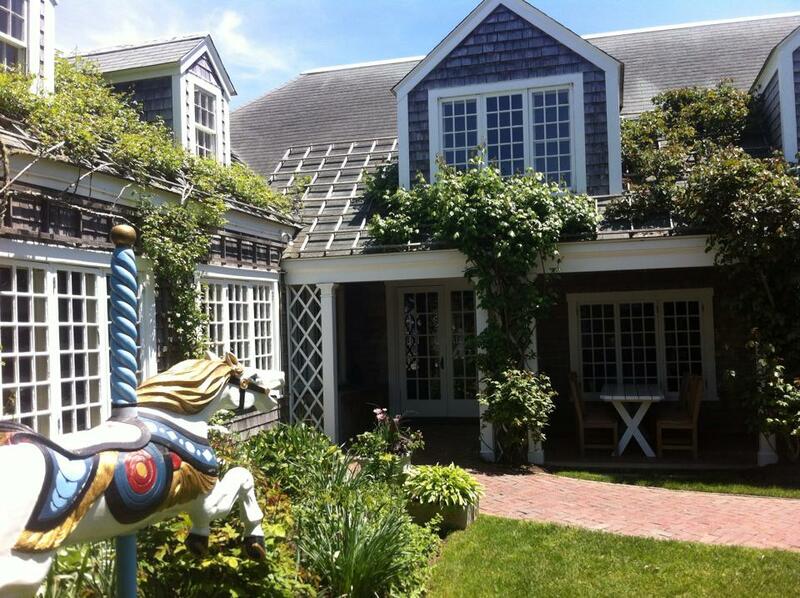 The annual August Fête will take place in the ‘Sconset neighborhood Sunset Heights, which includes the Underhill Cottages. Read below to discover the history behind 9 Pochick Street (Main Top) and the rest of the Underhill Cottages. At the Pochick lot, Underhill created a road down the middle of the parcel, and immediately began construction on his own cottage, China Closet, at the east end, on the south side of the street (now a secondary cottage for the house on Underhill was a man of many talents and was perhaps one of the most famous Sconseter’s of the nineteenth century. He was a Civil War reporter for The New York Times in the 1860s, a journalist for the New York Tribune in the 1880s, a famous New York court stenographer in an era when a court stenographer could be famous, a vineyard owner, rare book and china collector, noted wit, and ’Sconset enthusiast. He was especially gifted as a writer and promoter and is responsible for luring visitors to the village from across the country. Underhill’s advertising circular included a detailed description of the cottages: They are built . . . following the traditions of the builders of a hundred years ago, who made their houses strong and compact for comfort and convenience and with no thought that the structures they reared would ever be in demand for the residences of families from distant parts during the warm season. The only variations I have made from the strict simplicity of ’Sconset architecture are to have the apartments more commodious, and to avail myself of a few accessories which improve the appearance of the dwellings without, in the least degree, giving them the ornate look of modern built cottages at our fashionable seaside resorts. One of Underhill’s quirkiest creations was a room on wheels that could be rolled up to a cottage for additional living space. This innovation was most likely constructed by Asa Jones, along with George W. Rogers, Underhill’s carpenters of choice. 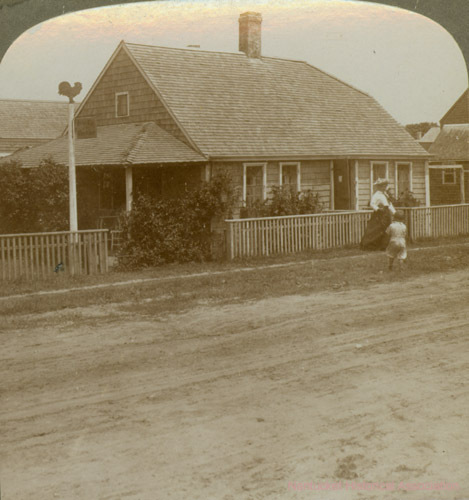 The cottages along Pochick, and Lily and Evelyn (named for Underhill’s daughter and wife), appear to have been built over several years, but individual cottages were built quickly—often completed according to newspaper accounts within ten or fourteen days. By the early 1880s, Underhill community was completed, and with nearly two dozen cottages was flourishing. In the 1890’s, it became known as the village’s “Actors’ Colony,” due to it being largely populated by Broadway actors and actresses, artists and writers, and other bohemian types. The Underhill cottages continued to be rented until the mid 1920s- often by the same families, year after year. “A View of Siasconset a Fishing Village on Nantucket” by David A. Leonard, 1797. Did You Know…That ’Sconset, first established as a fishing station in the late 1700s, was among the first summer resorts in the nation? 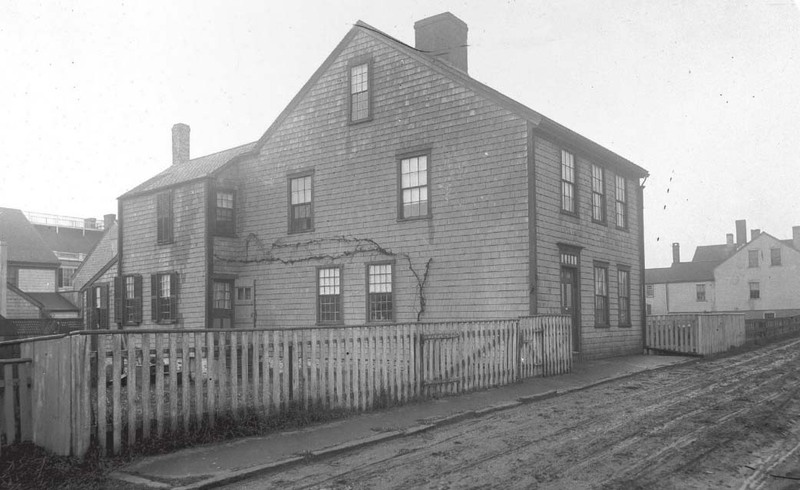 Those calling ’Sconset their home away from home included whaling captains and their families, prosperous whaling merchants, and retired mariners, including Benjamin Lawrence, a survivor of the ship Essex. By the end of the 19th century the village was referred to as The Actors Colony due to the large number of Broadway actors and artists who summered there. Today ‘Sconset retains much of its early architecture and still charms islanders and visitors alike. Experience ‘Sconset architecture at the 2014 August Fête featuring Sunset Heights neighborhood and Underhill Cottages click here for more information. The Chanticleer Restaurant circa 1890. –From “The Chanticleer Restaurant”, ’Sconset: A History. The Summer Lecture and Luncheon is SOLD OUT! Five Quince Street dates to the mid-eighteenth century, when it was the homestead of Nathaniel Hussey, his wife Judith Coffin, and their eight children. Hussey inherited the house from his father, Silvanus, a wealthy whaling merchant who bequeathed a dozen houses to family members when he died in 1765. In the late 1780s, David Hussey, son of Nathaniel and Judith, became the sole owner. His wife, Lydia, lived at 5 Quince Street probably longer than anyone else, for more than fifty years. The house was perhaps best known in the early twentieth century as the summer home of Austin Strong. Strong was the author of the Broadway show Seventh Heaven and other dramas, and on island was commodore of the Nantucket Yacht Club, a founder of the Wharf Rat Club, and originator of the rainbow fleet. Strong and his wife, Mary Wilson, completed a major renovation of the house in 1929 and retained most of the original elements and flavor of the old house. His heir ensured that the house would be protected by placing the island’s first interior preservation easement on the property. Did you know… that the first English settlement on-island occurred west of the present town? 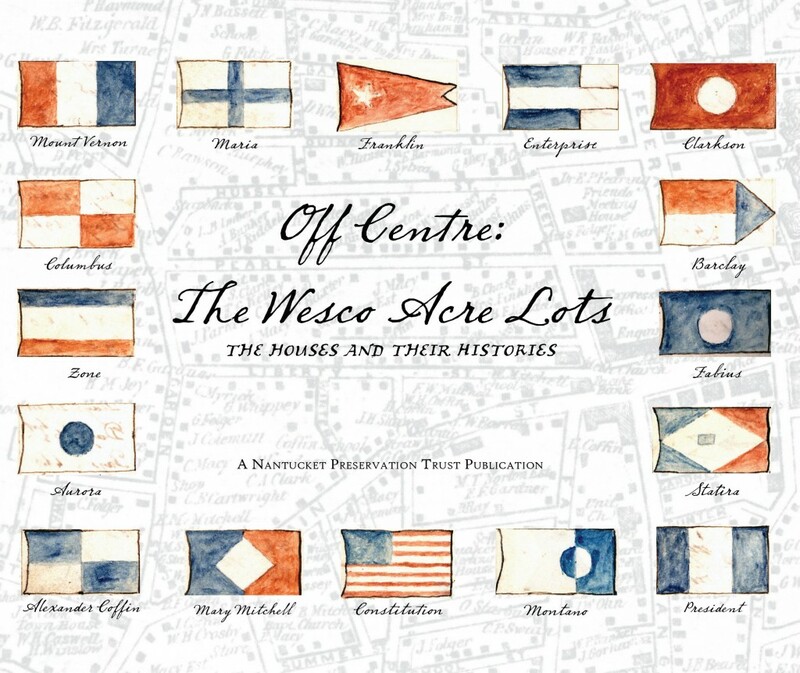 Islanders began to move to the easily accessible Great Harbor by the early 1700s to what is known as the Wesco Acre Lots, along Liberty, India, Hussey, and Quince streets. 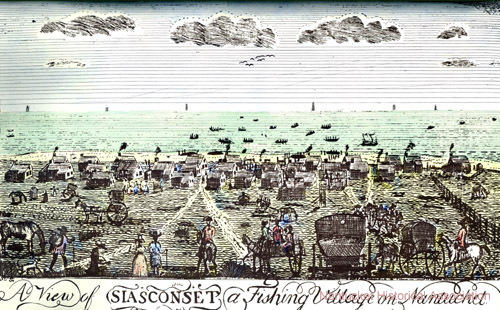 By 1717 the Fish Lots were surveyed—they are along Orange, Fair and Pine streets and included lots for tradesmen and craftsmen who were encouraged to build houses and shops. Both areas contain some of the island’s earliest buildings. *Discover the kitchens of Wesco Acre Lot houses at the 2014 Summer Kitchen Tour. To learn more and purchase your ticket click here. Cabinetmaker Cornelius Allen purchased the land at 14 Hussey Street in 1795 and built this home before selling it to Albert Folger, mariner, in 1798. Albert and his wife, Susan, raised five children here; Susan, widowed in 1812, lived here until 1840, when she sold the property to British-born Robert Ratliff. 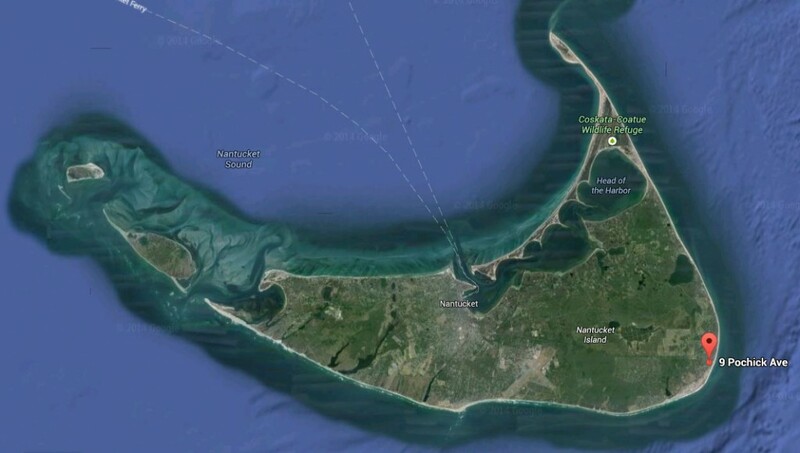 Among the neighborhood’s most famous residents, Ratliff at the age of twenty-five, while serving in the British Navy, had been shipwrecked off Nantucket. He decided to stay on island and married widow Judith Robinson, who had two daughters. He practiced his trade as a master rigger on Nantucket for more than fifty years and was immortalized in an 1879 painting by summer resident and renowned artist Eastman Johnson. Among the longest residents were Joseph P. Nye, master mariner and his family, who retained the property for over 130 years. 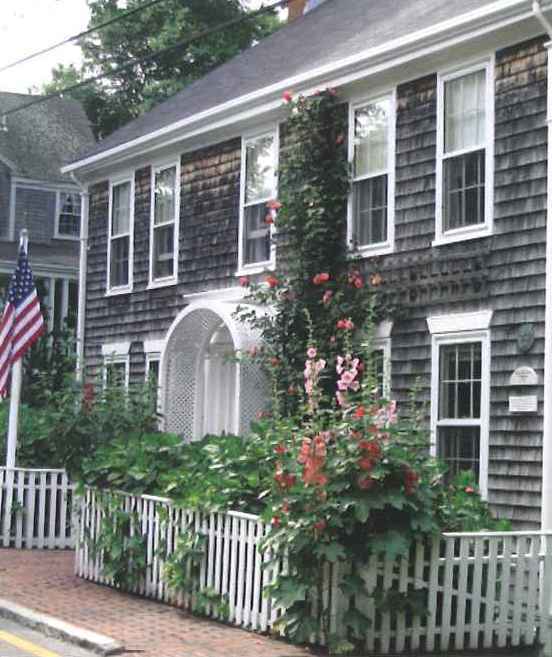 Most Nantucket houses originally had wood shingle roofs made of white pine, oak, or cedar. Other natural materials such as slate were found on a handful of public buildings, mansions and commercial buildings in town. Wood shingle roofs, although historically accurate, went out of fashion because of the concern about fire. 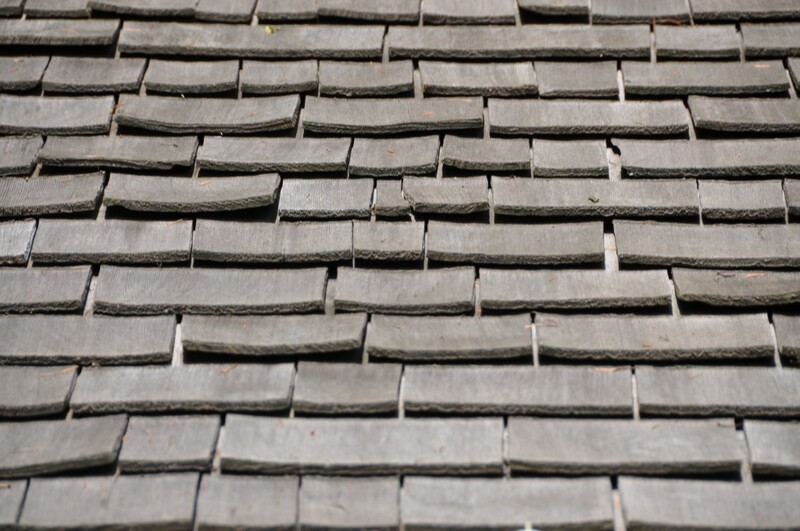 Asphalt shingle roofs have been installed on most historic houses over the past 50 years and still meet the local HDC guidelines. However today fire retardant wood shingles are making a comeback and can be found in many recent restoration projects. 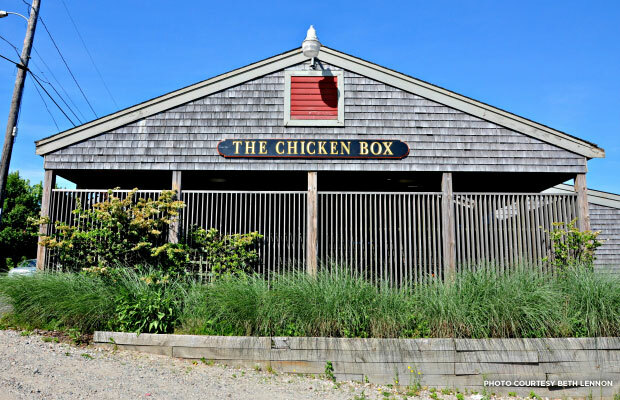 The National Trust for Historic Preservation recently compiled a list of historic bars and featured one of Nantucket’s most iconic bars, The Chicken Box . The original bar was started by Willie House and his wife over 66 years ago. They quickly became famous for the fried chicken, which lead to it’s name “The Chicken Box”. Today the building has had a few additions and changes but maintains the laid back feel of its beginnings. As Packy Norton (co-owner) stated in the article, “At The Chicken Box, everyone is equal, and everyone has a good time.” To learn more and discover the other historic bars on the list click here.